Cover from the NEF Green New Deal report, 2008. The idea of a Green New Deal (or New Green Deal), despite first appearing more than 10 years ago, has become very popular in recent months. These Green New Deals “make an analogy to the response to the Depression of the 1930s with an idea today that with greater state expenditure a huge effort can be put into developing the infrastructure of an economy based on renewables and a decarbonised energy system. This would simultaneously create jobs...”(1). There is a lot to agree with, given that a massive transformation is needed towards a clean economy. However, these proposals all assume continued economic growth, albeit “green growth”, and as we know, this is problematic since the material and energy flows entailed are what got us into ecological overshoot in the first place. 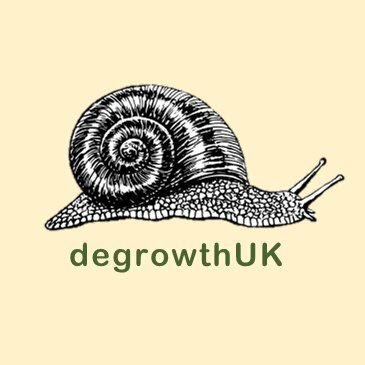 A number of pieces from across the degrowth community have raised various questions about these Green Deals and we thought it would be worth putting together a collection of links (3). If you spot others, do let us know and we’ll add them. In some versions of the New Green Deal, the growing GDP is rather hidden but it is, nevertheless there (as Burton discusses). However, one of the pioneers of the approach, Robert Pollin, celebrates the role of “green growth” contrasting it with the degrowth approach in a highly critical article in New Left Review. Responses have been made to this piece by Giorgos Kallis at TruthOut and by Mark Burton and Peter Somerville in New Left Review (2). None of us are saying that the degrowth alternative is an easy option. It is just that the biophysical realities mean it is the only option that will not make the situation worse by continuing to destroy the physical and biological systems on which life depends. The quotation is from Brian Davey’s piece, quoted above. The NLR articles are behind a paywall. If you can’t access them, then contact us and we can help. Thanks to Riccardo Mastini for spotting some of these and sharing them on twitter.